The outbreak of war in Europe in September, 1939, was the result of a number of factors. In simple terms the aggressive foreign policy of Hitler’s Third Reich and the lack of preventative measures by the major european powers to prevent Hitler’s increasing use of force in the mid to late 1930’s is to blame for the onset of Europe wide conflict. However this is a rather simplistic view of the reasons. War broke out in 1939 for a variety of reasons which can be traced back to the First World War and the peace treaties that were imposed on the defeated nations in its aftermath. Following the armistice of 1918 the the victorious Allied forces created a peace settlement that was designed to prevent the reemergence of a warring German race. In doing so they isolated Germany, restricted opportunities for German integration into the politics of Western Europe and sowed the seeds of German discontent. The high levels of unemployment in Germany following the war, and the growing feeling that the troops had been ‘stabbed in the back’ provided extremist political groups an ideal opportunity to win support. With Allied troops occupying parts of Germany and huge swathes of land being removed from the control of the Weimar Government, it was easy for political groups to point to the terms of the Treaty of Versailles and suggest that things would be much better if they were revoked. Hitler’s following breaches of the terms of Versailles made it increasingly apparent that conflict may occur in Europe. 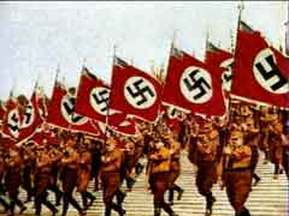 Hitler deployed troops in the Spanish Civil War, supporting the fascist forces of Franco. He also formed a close alliance with the fascist dictator of Italy, Benito Mussolini. Now there was an axis of Power in the centre of Europe. Now there were two right wing dictators with expansionist aims. The manner in which these aims were addressed by the rest of Europe is open to debate. The League of Nations was supposed to mediate in cases of territorial dispute and to act as arbitrator between two nations struggling to maintain reasonable diplomatic relations. The dictators of Europe were encouraged by the inability of the League to prevent them taking action, however. They looked to the Japanese invasion of Manchuria in 1933 and noted the League’s failure to prevent Japanese expansion. In 1936 Mussolini ordered Italian troops to invade Abyssinia (Ethiopia). The League of Nations took 2 months to decide upon a response, which then lacked ‘teeth’. Whatever the aim of Appeasement, Hitler viewed it as a weakness. Britain and France were extremely unlikely, in his mind, to do anything to prevent his expansion into the East, certainly not in the short term. The Sudentenland was ceded to Germany as a result of the plebiscite. Hitler then invaded the remainder of Czechoslovakia. The response of the British and French was to seek assurances from Hitler that he had no further demands. 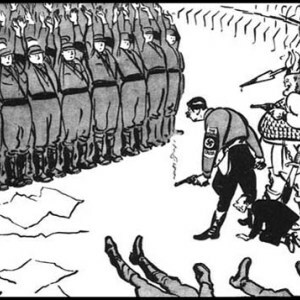 At the Munich Conference such assurances were made, and Hitler informed that any further actions of this nature would lead to war, a reference to Hitler’s ambitions in Poland. Following the Munich Agreement there was a flurry of diplomatic meetings with representatives of the Soviet Union. The British and French sought an alliance with the USSR as they believed that Hitler would be reluctant to invade Poland without the support of Stalin. Similarly, Hitler sought support from the USSR as he did not want to engage in war with Russia at this time. In August 1939, the German and Soviet foreign ministers made an agreement that gave half of Poland to each nation, in the event of a war. Confident that the Western European nations would not intervene in an Eastern European conflict, Hitler’s troops were ordered to invade Poland on the First of September 1939. The British and French declared war on Germany as a result.